In a recent review the bank found it did not have the right five years ago to raise the rate of interest for for these customers. 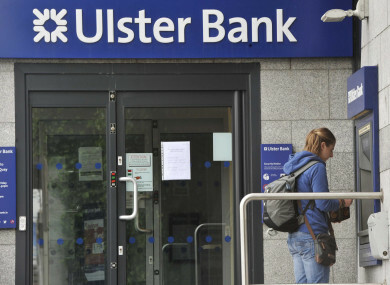 ULSTER BANK HAS acknowledged that some business customers who have been overcharged on loan repayments for the last five years did complain to the bank at the time their contracts were changed. Last week the bank revealed that it had discovered documentation issues in relation to 18,000 commercial loan accounts. The discovery was made in the course of a wide-ranging review in the bank launched as part of the tracker mortgage redress process. Speaking to members of the Oireachtas Finance Committee this afternoon, acting CEO Paul Stanley said customers were informed in letters in 2012 that the bank was changing the definition of ‘Cost of Funds’, a variable component of interest rate charged on the account. This essentially meant the rate of interest for these customers increased. He said the bank found in this recent review that contractually it did not have the right to change those rates in the case of 18,000 accounts. “We do apologise, it is not right what happened,” he said. Although he said the calculation of overcharged interests is “a complex exercise”, due in part to overdraft accounts, he said the bank expects redress and compensation to be paid the majority of impacted customers by the end of this year. There are currently 100 staff members working on this particular issue. Sinn Féin TD Pearse Doherty questioned bank officials about the issue, asking them in particular whether any of these customers had complained to the bank back in 2012, when their contracts were changed. Eddie Cullen, head of corporate and institutional banking, confirmed some of these customers did raise issues at the time, but added that there was “no particular spike” in complaints. “It didn’t lead to any further investigation at the time, which we need to look into for sure,” he told the committee. Members were also focused on the ongoing tracker mortgage scandal, which saw tens of thousands of customers across all the pillar banks overcharged because they were either denied the right to a tracker or were charged the incorrect rate of interest. Ulster Bank has so far identified more than 5,000 impacted customers and has paid back and compensated 2,900 so far. However TDs and Senators told officials that they were hearing from many impacted customers that the bank was not communicating with them to indicate how their case was progressing or when they would get their money back. Committee chair John McGuinness gave examples of customers who have been waiting since as far back as 2016 for a resolution and he said customers told him the bank’s staff were not returning their calls. “That is unacceptable,” acting CEO Paul Stanley responded. He said the situation “should be appropriately explained to customers”. Finishing up today’s proceedings, McGuinness said he hoped the Central Bank would do its job in terms of enforcement. Email “18,000 overcharged business accounts: Ulster Bank admits some customers complained five years ago”. Feedback on “18,000 overcharged business accounts: Ulster Bank admits some customers complained five years ago”.